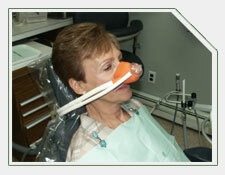 We use nitrous oxide sedation for those patients who are very fearful of the dentist. This does not put you to sleep, it just makes you feel very relaxed and at ease. We also use other sedatives that you have to take at home. You have to have a driver, but this procedure also works well to calm a very fearful patient. Our goal is ultimately your comfort.